A report to the U.N. Human Rights Council says nascent peace talks in Afghanistan offer a glimmer of hope to a country that has been at war for decades. The United Nations said 2018 was a particularly deadly year in the war between the government of Afghanistan and Taliban insurgents. It said nearly 11,000 civilians were killed and injured, including 927 children, the highest number since 2009. The U.N. blamed the Taliban and other terrorist groups for most of the casualties. Assistant Secretary-General for Human Rights Andrew Gilmour said, with the exception of Islamic State in Afghanistan, all parties to the conflict appear to be taking measures to mitigate harm to civilians. But he said additional concrete steps are needed. He welcomed the Afghan government's proposal last year for unconditional peace talks with the Taliban, saying this offers a glimmer of hope for peace. "The country witnessed a large-scale civic movement, demanding that the … armed groups renounce violence and engage in peace negotiations," he added. "Civil society and women's groups also began mobilizing around human and women's rights concerns, pressing for the inclusion and meaningful participation of women in any peace process." That is unlikely to happen as the Afghan government has been cut out of the peace talks that began in the last quarter of 2018 between the United States and the Taliban. 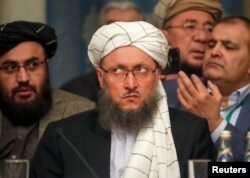 FILE - Deputy Head of Political Office of the Taliban Abdul Salam Hanafi attends a conference arranged by the Afghan diaspora in Moscow, Russia, Feb. 5, 2019. The militant group refuses to negotiate with the Afghan government, which it considers illegitimate. Afghan leaders are furious at not being included in the peace negotiations. They accuse the Afghan-born American diplomat Zalmay Khalilzad, who leads the talks, of blocking them from playing a role in planning their future. The U.S. government rejects the accusation. Gilmour made no mention of the claim. Instead, he weighed in on the importance of the talks to ensure human rights gains made by Afghans. He said no compromises must be made on issues of equality, non-discrimination, women's rights and the criminalization of torture. Under Taliban rule in the 1990s, women and girls were denied their human rights. They were forced to wear the burqa and be under the guardianship of a male. They were banned from going to school, to work, and engaging in politics. Afghan first secretary and Charge d'affairs Hamid Formuli said his country is committed to upholding and protecting women's rights. In response to criticism from Gilmour, he said the Afghan government has undertaken measures to prevent and combat violence against women.